Transform Your Smile with Dental Cosmetics! Yellow, crooked and missing teeth can impact your quality of life. Dental issues may lead to health problems, low self-esteem and difficulty performing everyday activities like eating or speaking. They can even hurt your job prospects and dating opportunities. If your smile is holding you back from the life that you deserve, then it might be time to call American Dental Care of Newark near Newark and East Orange, NJ. We help our patients to achieve healthy, beautiful smiles through dental cosmetics procedures. Show the World Your Bright, White Smile! Teeth whitening is the most requested cosmetic dentistry service. Many people want shiny, white, movie star smiles, but it’s easy to become overwhelmed by all the products and services out there. Sometimes, all you need is a thorough teeth cleaning to remove stains caused by a few too many cups of coffee. Other times, your smile has set-in stains that can benefit from in-office teeth whitening treatment. Our cosmetic dentist can help you achieve a much whiter smile in a single appointment. When you are missing several teeth, you may struggle with eating the foods that you love, speaking clearly or even going out in public with confidence. That’s why we offer our patients full and partial dentures. Today’s dentures are very comfortable and natural-looking, and they will last for many years. Are any of your teeth missing or badly damaged? With a dental implant, you can restore your smile. This is a small post that is inserted beneath your gums during a dental cosmetics procedure. It provides stable support for a dental crown or bridge. Dental implants look and feel just like your natural teeth, and with the right care, they can last a lifetime! Dental veneers are thin porcelain shells that can be bonded to your teeth. You may choose this if your teeth are cracked, chipped, discolored or have an unsightly gap. They look like the very best version of your natural teeth and blend seamlessly into your smile. They also help to protect a damaged tooth. Lower stress from lots of smiling! It’s not too late to fix your crooked teeth. We offer Invisalign braces for patients of all ages. These braces are transparent and slowly correct your smile over time. Unlike bulky metal braces, Invisalign is easy to remove for eating, sleeping and brushing your teeth. Most patients wear these invisible braces for eight months to a year to achieve their perfect smile. At American Dental Care of Newark, near Newark and East Orange, NJ, we understand your fears and concerns. 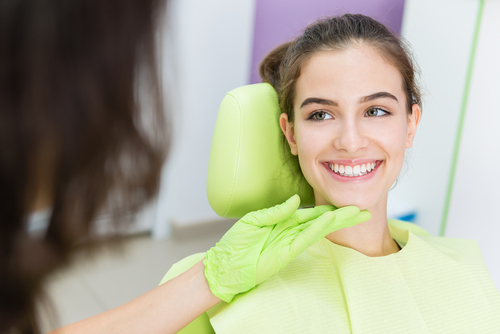 We offer a relaxing, pain-free experience, whether you come to us for cosmetic dentistry or emergency dental care. Call us today to schedule an appointment!